Counties - Cheyenne, Decatur, Gove, Logan, Rawlins, Sheridan, Sherman, Thomas and Wallace. Counties - Barton, Ellis, Graham, Ness, Norton, Osborne, Phillips, Rooks, Rush, Russell, Smith and Trego. Counties - Clay, Cloud, Dickinson, Ellsworth, Jewell, Lincoln, Mitchell, Ottawa, Republic, Saline and Washington. 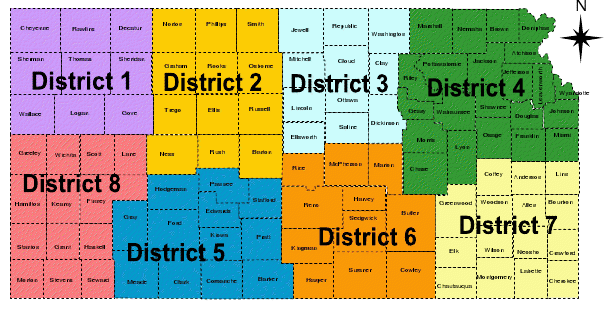 Counties - Atchison, Brown, Chase, Doniphan, Douglas, Franklin, Geary, Jackson, Jefferson, Johnson, Leavenworth, Lyon, Marshall, Miami, Morris, Nemaha, Osage, Pottawatomie, Riley, Shawnee, Wabaunsee and Wyandotte. Meade, Pawnee, Pratt and Stafford. Elk, Greenwood, Labette, Linn, Montgomery, Neosho, Wilson and Woodson. Scott, Seward, Stanton, Stevens and Wichita. If you are unable to complete your membership online please contact the Secretary-Treasurer at KSAFC for assistance or you may call 785-423-3697. The online membership form provides the links so that the association can quickly communicate. The Executive Board of the KSAFC encourages you to ensure its accuracy and completeness. Membership application and renewal is designed so each member to can review and complete their contact information and select a payment method. In those cases where one member wishes to pay for multiple department/agency members online with a purchasing or credit card we have provided a link with instructions on how to do so. If this method is selected each member must still log on to to complete their contact information. 01. KSAFC Individual - Regular Membership - $40.00 (USD) Subscription period: 1 year, on: January 1st No automatically recurring payments Active Regular Member: Any administrative officer, or company officer as determined by the fire chief, in any recognized fire department or fire brigade in the state of Kansas is eligible to be an active member in this organization and shall be entitled to all the privileges. 02. KSAFC Individual - Pro-Chief Section - Chief of Department (Reg Memeber) - $80.00 (USD) Subscription period: 1 year, on: January 1st No automatically recurring payments For Fire Chiefs, Department Directors and equivalent department heads. To determine if you are eligible for this option please review the KPFC Bylaws. 03. KSAFC Individual - Pro Chief Section - Associate Member - $60.00 (USD) Subscription period: 1 year, on: January 1st No automatically recurring payments For department members other than the department head. Associate members department head must be an active KPFC Regular member to select this option. To determine if you are eligible for this option please review the KPFC Bylaws. 04. KSAFC - Senior Member - $20.00 (USD) Subscription period: 1 year, on: January 1st No automatically recurring payments Senior Member: Any Retired and/or former Active Members who have served as active members. Senior Members shall be entitled to all the privileges of the Organization including voting rights. Dues for Senior Members are set at 50% of Active Member Dues. 05. KSAFC - Associate Member - $40.00 (USD) Subscription period: 1 year, on: January 15th No automatically recurring payments Associate Member: Any person who is ineligible for active membership but who is interested in the objectives of this organization except those of voting and holding office. 06. KSAFC - Sustaining Member - $50.00 (USD) Subscription period: Unlimited Sustaining Member: Any business concern that is interested in the objective of the organization may become a sustaining member and shall be entitled to all the privileges of the organization except those of voting and holding office.